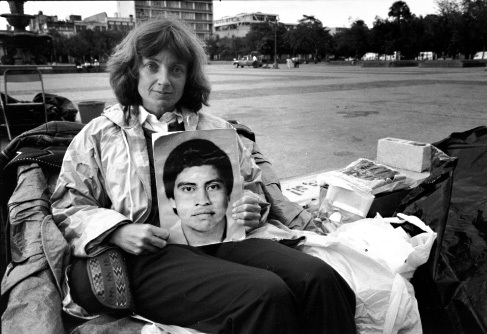 American Jennifer Harbury with a picture of her husband, Everardo Bámaca, a Mayan rebel leader whose whereabouts remain among the list of thousands of Guatemalans disappeared during the 36-year internal conflict. Courtesy of Patricia Goudvis, www.patgoudvis.com. Photos courtesy of Jean-Marie Simon, Guatemala: Eternal Spring, Eternal Tyranny. 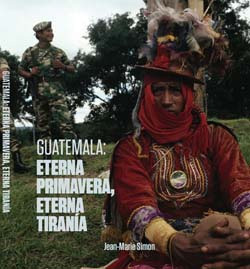 More photos of Guatemala can be found in Jean-Marie Simon's newly-released Spanish version of her book Guatemala: Eterna Primavera, Eterna Tiranía. The entire NACLA Report on the Americas is available, here. January 26 marked a watershed in Guatemalan history. That evening, after more than eight hours of arguments from prosecutors and defense lawyers, retired army general Efraín Ríos Montt—the military leader who presided over the most intense and bloody period of state repression in the country’s modern history—was formally charged by Judge Carol Patricia Flores with genocide and crimes against humanity. Ríos Montt now faces the real possibility of a criminal trial. Inside the courtroom on the 15th floor of the Tribunal Tower in Guatemala City, the verdict was met with the mechanical gasp of a dozen camera shutters clicking simultaneously. Downstairs, in the plaza outside the building, hundreds of massacre survivors and families of victims were watching the proceedings on open-air screens. They cheered, applauded, and wept at the astonishing news. The criminal acts at the heart of the indictment took place 30 years ago, in 1982–83, when Ríos Montt’s armed forces unleashed a savage counterinsurgency campaign that massacred thousands of unarmed Mayan civilians in the country’s northwestern department of Quiché. 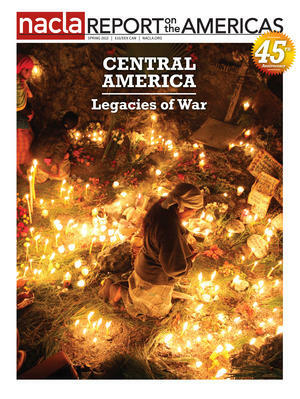 Investigations into his regime’s scorched-earth operations prompted the Historical Clarification Commission (CEH)—Guatemala’s truth commission—to declare in 1999 that “acts of genocide” had taken place in the Quiché’s Ixil region and other areas during the 36-year internal conflict. The finding opened the door to the possible prosecution of senior army officers and their commander in chief. But for years, Ríos Montt avoided facing charges, thanks to judicial inaction, elite complicity, and political immunity, frustrating efforts by human rights lawyers representing the affected communities to mount a legal case. The ruling on January 26 changed everything. There are two winds blowing in Guatemala today. One is the gale force of the country’s newly named public prosecutor, Claudia Paz y Paz, whose determination to pursue the masterminds of the army’s war on its citizens has led to groundbreaking indictments, including Ríos Montt’s. The other is the rising storm of right-wing outrage and resistance, which helped to sweep President Otto Pérez Molina into office in November. Pérez Molina, another retired general, had a long and varied career in the military, culminating in his role as one of the government’s negotiators in the peace talks that led to the accord. He also served as one of Ríos Montt’s field commanders, in Nebaj, a town in the heart of the country’s Ixil region. Impunity in Guatemala has long been a stumbling block to consolidating the rule of law following the end of the civil conflict. In 1994, government peace negotiators were careful to design the mandate of the future truth commission in order to avoid “individualizing responsibility” and to delink it from the judicial process.2 When the final accord was signed two years later, Congress quickly passed the National Reconciliation Law, granting limited amnesty for crimes connected to the war. Early efforts to try human rights perpetrators were messy, frustrating affairs. The trial of army officers and civilians in the 1998 assassination of Bishop Juan José Gerardi, for example, led to the unprecedented convictions of three military men and a priest in 2001, but only after prosecutors overcame a tortuous series of legal obstacles and fraudulent “experts” presented by the defense. It still remains unclear who masterminded the killing. An equally groundbreaking 2002 conviction against Colonel Juan Valencia Osorio, for the 1990 stabbing death of anthropologist Myrna Mack, was torpedoed days later when Valencia turned fugitive by “escaping” from house arrest, while under police custody. Human rights groups and communities affected by violence continued to investigate historic abuses despite setbacks. In Huehuetenango, Chimaltenango, Quiché, and Verapaces—regions of the countryside hardest hit by the army during the war—local organizations helped exhumation teams identify mass graves. They also gathered testimonies and preserved documents that could be used in future prosecutions. In Xamán, Alta Verapaz, survivors of a massacre that killed 11 residents in 1995 became the first indigenous plaintiffs in a criminal case charging members of the military with human rights crimes. Despite constant threats to witnesses and judicial authorities, the case resulted in the 2004 sentencing of 13 soldiers and one officer to 40 years in prison each for their roles in the massacre. Another breakthrough in human rights litigation took place in 2009, after Guatemala’s Constitutional Court ruled that forced disappearance was a “permanent crime” due to the lack of a body and was therefore not restricted by a statute of limitations. Immediately following the decision, two separate trials resulted in long sentences for military perpetrators: military commissioner Felipe Cusanero was found guilty of the forced disappearance of six indigenous residents of Choatalúm, Chimaltenango, between 1982 and 1984, and a court in Chiquimula convicted Colonel Marco Antonio Sánchez Samayoa and three military commissioners for the disappearance of eight family members in the village of El Jute in October 1981. In the case of El Jute, Sánchez Samayoa—chief of the Zacapa military zone and indicted for his command authority in the area rather than his material involvement in the crime—lost the amnesty protection he was initially granted under the National Reconciliation Law on the grounds that it did not apply to internationally recognized crimes against humanity. If the permanent commitment of local human rights activists contributed to their successes in court, so too did the increasing engagement of the country’s judicial institutions. International actors helped prod the courts and the Public Ministry into action. In 2010, the United Nations institutionalized what had been an ongoing effort to strengthen Guatemala’s legal system by launching its Transitional Justice Program (PAJUST) with support from a group of interested governments, including Denmark, Holland, Sweden, and the United States. PAJUST seeks to improve investigations into some of the most pressing human rights cases from the past through funding for the Public Ministry, the Peace Secretariat, and other agencies and nongovernmental groups.3 In October 2010, government prosecutors won a conviction against two police agents for the 1984 forced disappearance of labor leader Edgar Fernando García, largely owing to records found in the Historic Archives of the National Police (which is funded by PAJUST) and used as evidence in the trial. In 1992, Guatemalan rebel commander Efraín Bámaca Velásquez of the Revolutionary Organization of the Armed People (ORPA) was captured in a clash with the military and subjected to months of interrogation and torture before being disappeared. Although Guatemalan president Otto Pérez Molina has repeatedly denied any acknowledge of Bámaca's fate, there is extensive evidence that the Intelligence Directorate (D-2)-which Pérez Molina headed at the time-commanded Bámaca's secret detention, controlled and monitored his torture, and chose when and how he was killed. A document signed by a group of unidentified Guatemalan military officers and given to the U.S. embassy in Guatemala describing the presence of Pérez Molina at a meeting of 50 senior army officers on March 12, 1992, the day that Bámaca was captured. The meeting, which took place at the military base where Bámaca was taken after he was detained, was subsequently confirmed in confidential Guatemalan army telegrams submitted as evidence before the Inter-American Court of Human Rights in 1998. Accounts of former prisoners of the Guatemalan army, submitted to the United Nations, describing Bámaca's secret detention and torture by intelligence officers acting under orders of the D-2. But it was the appointment of Paz y Paz at the end of 2010 that has transformed the Public Ministry and demolished the business-as-usual attitude of indifference and scorn normally reserved by the country’s most notorious human rights violators for the demand for justice. In her brief term in office so far, Paz y Paz has overseen the capture of five senior military and police officers, including Ríos Montt and another former head of state, Óscar Mejía Víctores (1983–86), for gross human rights abuses. With the exception of Mejía Víctores, who has been declared mentally incompetent, all are under preventative detention or house arrest awaiting trial dates. Paz y Paz’s lawyers also won convictions against former members of the Kaibil Special Forces for their roles in the brutal Dos Erres massacre of 1982, a case that had languished for almost 15 years through the inaction of her predecessors. In a stunning affirmation of the prosecution’s case, the first circuit court sentenced the four Kaibiles to 6,060 years in prison: a total of 30 years each for each of the documented 201 men, women, and dozens of children slaughtered by the special unit, plus 30 years for crimes against humanity. Paz y Paz was an unlikely choice for the highest judicial office in Guatemala. She was an academic with the Institute of Comparative Studies in Criminal Sciences. She taught law in the national university and had a record of human rights work, including a stint in the Archbishop’s Office of Human Rights in the 1990s.4 During the selection process, her candidacy was promoted by human rights organizations and other civil society groups, but she was only named after a nasty scandal shook the UN-sponsored International Commission against Impunity in Guatemala (CICIG), paving the way for her appointment. Established in late 2007 as a multinational investigative body designed to ferret out corruption and expose organized crime, CICIG has worked with Guatemalan police, prosecutors, and judges to assemble some of the most sensitive criminal cases, often targeting the country’s most powerful and well-connected figures. In May 2010, a new public prosecutor, Conrado Reyes, began firing staff and dismantling corruption investigations painstakingly built by his ministry over two years of collaboration with the UN unit. CICIG’s director, Carlos Castresana, retaliated by abruptly announcing his resignation during an explosive press conference in which he revealed evidence linking Reyes to organized crime. Days later in a second press conference Castresana also exposed a smear campaign directed against him. Within a week of Castresana’s resignation, Guatemala’s Supreme Court had removed Reyes and ordered a new selection process to begin for his post. That June, the United Nations named Francisco Dall’Anese Ruiz, a former Costa Rican attorney general with experience in government corruption cases, to take over CICIG. In December, President Álvaro Colom announced that Paz y Paz would lead the prosecutor’s office. Since then, Paz y Paz has cast her net wide, with spectacular results. In collaboration with the Minister of Interior, Carlos Menocal, her investigators have hunted down major drug criminals, capturing five of the country’s 10 most-wanted narco-traffickers, disrupting the Sinaloa Cartel’s operations in Guatemala, and arresting associates of the Mexican Zetas. She has gone after corruption, cleaning her own house first by launching an evaluation system within the Public Ministry soon after taking office and using the results to suspend and fire dozens of incompetent or venal prosecutors. Nationally, the ministry’s corruption probes have reached the highest circles of power, including an investigation that led to arrest warrants for Gloria Torres—sister of Sandra Torres, ex-wife of former president Colom—and her two daughters on money-laundering charges.5 The judicial system’s rapid response to serious crimes, such as the beheading of 27 farm workers in the northern department of the Petén last May and the assassination of the beloved Argentine musician Facundo Cabral when he was touring Guatemala in July, has led to the arrest of suspects within days, in sharp contrast to past practices. To what extent these improvements are sustainable remains an open question. It is not even clear whether or not Paz y Paz will keep her job. Two thousand and eleven was an election year, and as the public prosecutor and her allies labored to advance the rule of law, Pérez Molina and his right-wing Patriotic Party campaigned across the country on his plans to solve the security crisis with an “iron fist” (mano dura). On November 6, Pérez Molina won a strong victory over his rival, politician and businessman Manuel Balidzón, and on January 14 he was sworn in as Guatemala’s newest president. His election has dismayed human rights advocates who hold him responsible for the same genocidal crimes committed in the Quiché that will be debated in the coming Ríos Montt trial. The public biography of Pérez Molina is silent on the matter.6 The little that is known about his past reflects the career of a talented and ambitious military man. He was an operations officer who came of age in the 1970s and rose from unit commander to Director of Operations (D-3), chief of the Kaibil training center and head of the Presidential General Staff. He was a product of the U.S. School of the Americas and left a trail of high marks and glowing evaluations. In the early 1990s, a power struggle inside the army landed him as head of the Intelligence Directorate, where he made his first real impression on the wider public when then president Jorge Serrano attempted an autogolpe, or internal coup, in 1993. Pérez Molina’s successful opposition to Serrano’s power grab made him stand out as a moderate among extremists, pitting him against the cabal of powerful intelligence officers known as the Cofradía (Brotherhood) that backed Serrano. 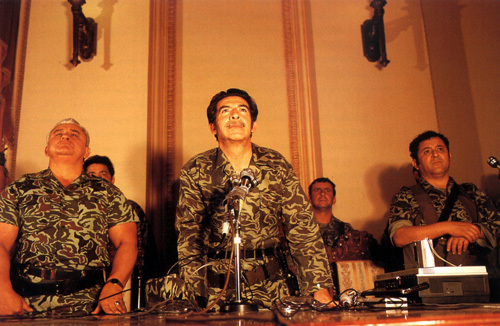 The Operación Sofía records, along with a key military strategy document called Plan Victoria 82 that prosecutors obtained after years of litigation, now serve as evidence in the criminal case against Ríos Montt. 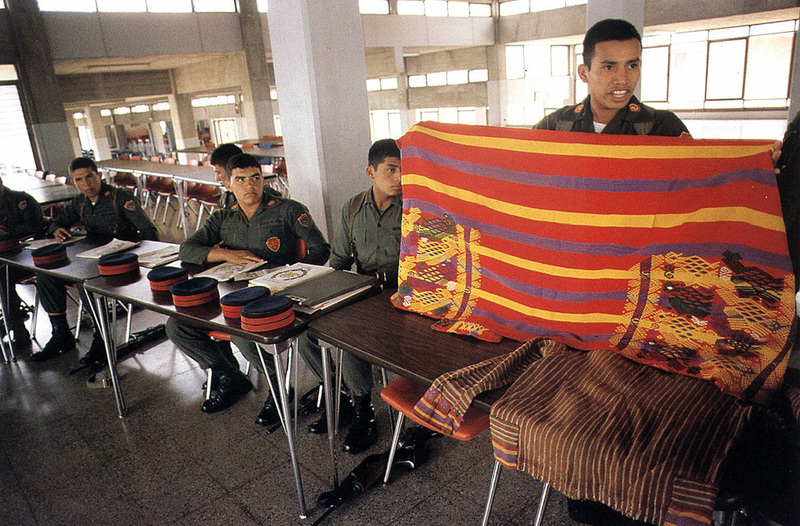 But by and large the Guatemalan army has successfully maintained its iron grip on its files and has avoided releasing information about the war on “national security” grounds. When Colom declared in 2008 that he believed historic military records should be available to the public, the Defense Ministry responded by creating a Commission on Military Archives that reviewed the army’s holdings for disclosure. In June the military opened what it says are 11,000 documents and established a reading room where the public can consult the material. It is a limited step toward accountability, to say the least. Although there is no guide or index explaining the contents of the archive, the army has already admitted that it includes no records from the critical period from 1980 to 1985. Ever the operator, Pérez Molina has found a way to use the military’s continued secrecy to undermine the history of the war as established by the truth commission. In a televised conversation in July with Martín Rodríguez, director of the online news service Plaza Público, the retired general argued that precisely because the army refused to engage with the CEH and would not turn over its records to investigators, the commission was unable to arrive at the truth of what happened. In spite of Pérez Molina’s critique, his comments show just how far the tireless efforts of human rights groups have pushed the debate. 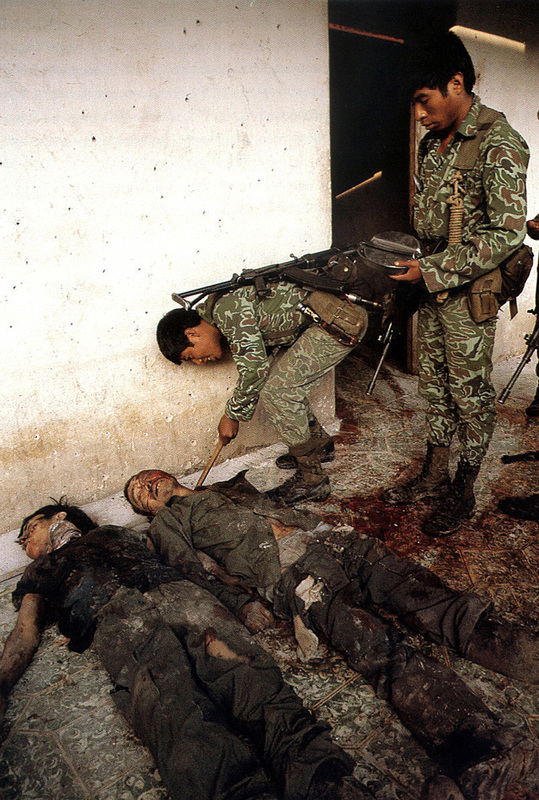 The military and political right in Guatemala can no longer deny the existence of massacres. The trials have derailed that narrative. Three legal complaints have been filed since November accusing dozens of individuals on the left and in civil society of acts of terrorism and “crimes against humanity” committed during the conflict. In one, the son of Ríos Montt’s interior minister identifies 26 people he claimed engineered his kidnapping (or “attempted disappearance,” as he calls it) by guerrillas in 1982. Another, introduced by coffee businessman Theodore Plocharski, seeks indictments against 52 people for the kidnapping and execution of one Guatemalan and nine foreign diplomats, including U.S. Ambassador John Gordon Mein, who died in a botched kidnap attempt by the Revolutionary Armed Forces (FAR) in 1968. When asked by the Guatemalan newspaper El Periódico to explain his lawsuit, Plocharski said he sought to reveal “the truth about the war.” The complaints appear to be hastily composed and poorly conceived—those accused include well-known guerrilla leaders, human rights activists, elected members of Congress, former first lady Sandra Torres, U.S. photographer Jean-Marie Simon, and journalist Marielos Monzón, who, as she has pointed out, was born three years after the Mein assassination. The roll call more closely resembles death-squad lists from past decades than legitimate legal accusations. But the political motives are clear. All three lawsuits accuse relatives of Paz y Paz, including her father, a former head of the FAR. Pérez Molina has suggested that Paz y Paz, whose supporters include U.S. secretary of state Hillary Clinton and UN secretary-general Ban Ki-moon, can remain as long as she performs her job with impartiality. He has given similar qualified approval to the continued presence of the international investigative unit, CICIG. But as he has assembled his government and launched his earliest initiatives to address Guatemala’s security crisis, he has already begun wielding the mano dura he promised during his campaign. The president appointed Colonel Ulises Anzueto, a retired Kaibil, as his minister of defense and placed the reviled special forces unit in charge of the fight against narcotrafficking, despite well-documented links between former Kaibiles and some of the region’s leading cartels. His interior minister, retired general Mauricio López Bonilla, is another former army commander, who will oversee the hiring of thousands of new police officers to combat drugs and organized crime. To help pay for his security program, he plans to ask the United States to lift its ban on military aid. The Ríos Montt trial will unfold within this polarized climate. The aging dictator’s defense lawyers will undoubtedly try to derail the case through pointless appeals, challenges of the court’s competence, and other legal maneuvers. But it will be impossible to halt altogether without provoking a storm of national and international outrage. Now that the indictment has been issued—making Guatemala one of only three countries in Latin America with the wherewithal to charge a head of state with human rights crimes (along with Peru and Uruguay)—the whole world is watching. There is nothing more electrifying than seeing a former strongman forced to face his accusers in a court of law. Unless it is seeing an image of his younger self as it appeared 30 years ago, when he was at the height of his powers, projected by prosecutors onto the courtroom wall above him. The year was 1982, the interviewer was a young documentary filmmaker, and Ríos Montt was angrily denying the existence of military repression in Guatemala.14 His words now serve as evidence of his command authority over the scorched earth campaigns. Kate Doyle is a senior analyst and director of the Guatemala Documentation Project at the National Security Archive. In May she will receive the ALBA/Puffin Foundation Award for Human Rights Activism. 1. Ustream broadcast the proceedings live on January 26; quotes are excerpted from that broadcast. An audiotape of the hearing is archived by the Center for Human Rights Legal Action at caldh.org. 2. See Secretaría de la Paz, Presidencia de la Republica de Guatemala, Acuerdo sobre el Establecimiento de la Comisión para el Esclarecimiento Histórico de las Violaciones de los Derechos Humanos y los Hechos de Violencia que Han Causado Sufrimientos a la Población Guatemalteca, Oslo, Norway, June 23, 1994, Funcionamiento, III, available here. 3. For a good description of PAJUST, see the 2011 report of one of its grantees, the Forensic Anthropology Foundation of Guatemala, “Informe Programa PAJUST,” April 2011, available at fafg.org. 4. Luis Ángel Sas, “La fiscal que movió el árbol,” Plaza Pública, June 29, 2011, available at plazapublica.com.gt. 5. Natalie Kitroeff, “Justice in Guatemala,” Americas Quarterly, January 9, 2012, americasquarterly.org/node/3189. 6. For example, the profile posted during his presidential run: Elecciones Guatemala, “Otto Pérez Molina,” April 11, 2011, available at eleccionesguatemala.org. 7. These biographical details come not from Guatemalan records but from declassified U.S. documents released to the National Security Archive under the Freedom of Information Act and available in the Archive’s holdings. “Best and the Brightest”: Defense Intelligence Agency (DIA), “A Guatemalan Army Trilogy, Part 2, The Colonels (Part 2 of [Deleted] Swan Song),” January 4, 1994; ‘Blood stains’: DIA, “Colonel Otto Pérez Molina Today,” April 20, 1994. 8. Jennifer Schirmer, A Violence Called Democracy: The Guatemalan Military Project (University of Pennsylvania Press, 1998), 44. 9. See Mica Rosenberg and Mike McDonald, “Special Report: New Guatemala Leader Faces Questions about the Past,” Reuters, November 11, 2011. 10. The files of Operación Sofía were given to the National Security Archive by a confidential source in 2009 and subsequently provided to the lawyers in the genocide case. See the Archive’s website, National Security Archive, Operación Sofía, Part 4, July 22 report, page 20; Helicopter log: page 41, available at gwu.edu/~nsarchiv. 11. Martín Rodríguez Pellecer, “Quiero que alguien me demuestre que hubo genocidio,” Plaza Pública, July 25, 2011, available at plazapublica.com.gt; go to 26:00 of the archived broadcast of the conversation between Martín Rodríguez Pellecer and Otto Pérez Molina to hear Pérez Molina discuss the work of the CEH. 12. For a discussion of the regional right-wing push to co-opt human rights language and tactics, see “The Politics of Human Rights,” NACLA Report on the Americas 44, no. 5 (September/October 2011). 13. Byron Rolando Vásquez, “Denuncian a hermana de Colom y a primas de la Fiscal,” Siglo 21 (Guatemala City), November 3, 2011; Jerson Ramos, “Theodore Plocharski ‘Intento que se conozca la verdad de la guerra,’” El Periódico (Guatemala City), December 15, 2011, available at elperiodico.com.gt. 14. 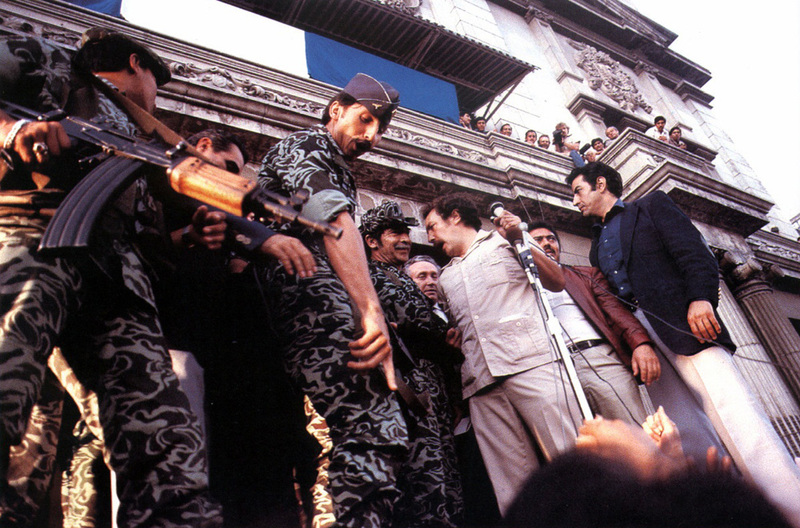 The 1982 clip appears in Granito: How to Nail a Dictator, a documentary film by Pamela Yates, Paco de Onis, and Peter Kinoy (2011). Interview by Yates.